Welcome to the March “Notes” post. Yesterday we saw a great finish at the Valspar, with Nike athlete Tony Finau finishing the highest among the Swoosh staffers. Finau shot a final round 64 to finish in 5th place. 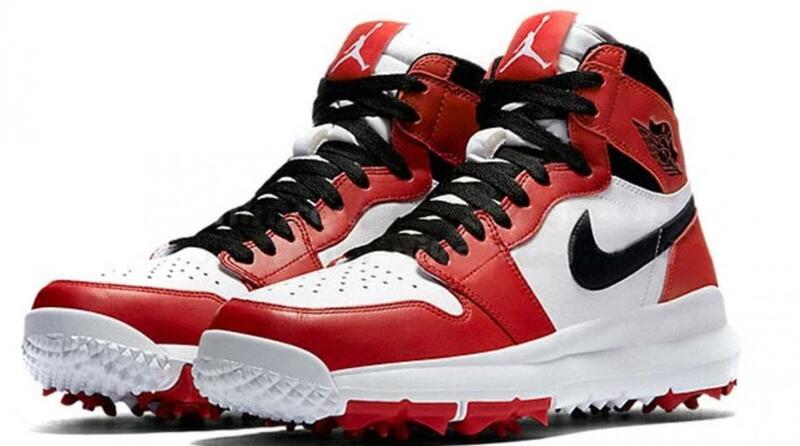 In early February, Nike announced that the long-rumored Air Jordan I golf shoe would be released to the public. The iconic shoe was released on February 10 and came in two colorways – the original red/black and a more subtle white/white. Later that month, Golf.com posted their 2017 Best Golf Shoes and the Air Jordan I made the list. I was looking for a good way to represent Nike Golf this year when I found the novelty hat and shirt. These are my favorites so far from their “off the course” apparel. Without much splash, the FI Flex was released to the public. This is a nice walking shoe, although with the continued onslaught of athletic type golf shoes, I am hoping that Nike will soon release a golf shoe that pairs classic looks with athlete performance. First making its way around the rumor mill in the Summer, the Air Zoom Gimme raised a lot of eyebrows with its velcro strap closure. Perhaps the designers wanted to leverage the look and feel from the LeBron Soldier 10. In any event, the Gimme is finally out and it features a soft, breathable upper with a midfoot strap to provide lightweight support. It also has a flexible outsole and Integrated Traction pattern that promises exceptional groundfeel. Conceptually, the idea makes a lot of sense, but I’d have to test it out to truly see if this is something I can buy into. With Nike out of hardgoods, quite a few “Tour Only” Nike putter headcovers have found their way onto eBay. These headcovers were only provided to Nike Golf athletes, and were never made available to the public making them highly coveted. As I looked around on eBay, I found many variations of the ones that the pros use. So I caution everyone who is interested to make sure that what you are getting is authentic. As far as I know, the originals were made by AM&E, the same maker for the most popular putter headcovers in the game. Below you’ll see a difference in some of the ones I found. Some have velcro closure, some of magnetic closure, but to me, the one in the middle is the most representative of the real “Tour Only” headcover – currently on sale for $400. Six European golf athletes, including eight-time European Tour winner Alex Noren and European Ryder Cup star Thomas Pieters, have joined the Nike Golf team. Their signing follows announcement of World No. 1 Jason Day’s commitment to the brand. The other signings include Alexander Levy (France), a three-time winner on The European Tour; 2015 BMW Masters champion Kristoffer Broberg (Sweden); and The European Tour newcomers Alexander Knappe (Germany) and Pep Angles (Spain). All six athletes will wear Nike apparel and footwear, and have been working with Nike product and sports marketing teams in the off-season to ascertain which innovations best suit their game. Noren — currently the 10th-ranked player in the world — resumes his 2017 season this week after ending 2016 with four memorable wins at the Aberdeen Asset Management Scottish Open, Omega European Masters, British Masters supported by Sky Sports and the Nedbank Golf Challenge hosted by Gary Player. Belgian Pieters, already well known in Europe, made a considerable impression on the wider golfing world during last year’s Ryder Cup, winning four of his five matches — the first European rookie ever to do so. Like Levy, he is a three-time European Tour winner, the last of his victories coming at the 2016 Made in Denmark tournament at Himmerland Golf and Spa resort. Noren, Pieters, Levy, Broberg and Knappe will all be competing in this week’s Abu Dhabi HSBC Championship. Nike Golf is once against taking a bold step with golf fashion. If you thought bringing tights with shorts, collarless polos, and joggers was out of bounds, it seems the company is doubling down this season with items such as the Coaches Golf Blazer and a $60 Crew neck t-shirt. One thing is certain – Nike is definitely leading in innovation and change in golf apparel. New promotional photos on Nike Golf’s website show that Day will have the logo of his corporate sponsor, Lexus, on the left sleeve of his Nike shirt. This was confirmed this week during his practice sessions and press conference at the SBS Tournament of Champions. This is particularly notable because Nike Golf contracts in the past have commanded full coverage of an athlete’s apparel, meaning that no other sponsor could have placement on a hat, shirt, or other apparel. This make mark a change for the rest of the Nike athletes and what their apparel may look like going forward. With Nike out of the equipment, ball, and bag business, many of the athletes have tested out or signed equipment deals with other manufacturers. This month’s most reported change was Rory McIlory’s switch to a combination of Callaway, Titleist, and Odyssey equipment, along with the 2017 ProV1x ball. Tony Finau also debuted his new bag that included a combination of Ping, Callaway, Titleist, and Scotty Cameron. Meanwhile, JJ Spaun signed with Srixon and Patrick Rodgers signed with Callaway. Recent photos of Paul Casey showed him with a TaylorMade driver and Titleist ball and Jhonnatan Vegas was spotted with Mizuno irons. You can stay up to date with all the equipment changes at Jonathan Wall’s post here. He is pretty much the authoritative media figure on equipment. Early January saw the release of the fourth of five colorways for the Lunar Control Vapor. To go along the white, black, and wolf grey colorways, Nike recently released the khaki colorway, officially labeled as Cargo Khaki/Palm Green/Light Bone/Lava Glow. The Cargo Khaki and Palm Green combination seems to be a major theme in this year’s apparel line.